If Chuck Pierce is right, we will be glad we read this word ahead of time. It is encouraging us to trust the Lord and to not fear the shakings that are coming which in the natural seem so frightful. Elijah List founder, Steve Schultz, reiterated what he felt Chuck was prophesying before he posted the word so the message is communicated in two different manners. "DO NOT BE AFRAID WHEN THE BULL BEGINS TO RUN AGAIN!" This is the prophetic revelation that many of you have been waiting for. You want to get a Word from the Lord from a prophet about the financial situation in the USA and in the earth. You want to know what's going to happen with the Stock Market. And you want to know what the next year or two holds. OK, the good news is that this word by Chuck Pierce is quite specific and even names dates. The challenge is that this is not going to be the easiest word to understand, so let me try to clarify some things here. Two of Chuck's trusted prophetic friends had dreams about the financial crisis. The Lord then gave Chuck the interpretations of these dreams plus some direction for God's people. 1) God's intention is to help the Body of Christ prosper in the days ahead because of the shift that is taking place. 2) DO NOT FEAR. Say this over and over again, "God is in control. I will not be afraid! Chuck Pierce: I want you to stop and understand one thing about wealth: Wealth does not go away. Rather, wealth is transferred from place to place to place. You are not to think, "Oh my, everything is going to crash and the wealth will be gone." That is not how it works. Rather, you are to ask "How will it be transferred?" and "How will this transfer affect you?" 4) IMPORTANT: Chuck said there will be ONE MORE GREAT SHAKING NEXT MONTH! THAT MEANS SEPTEMBER! Chuck Pierce: The Beast is a coalition that is organized to manipulate the transference of wealth this hour. There will be one more great shaking in the next month. Then we must see how to move with revelation that will secure the operations of God's Kingdom for the next two years. Chuck Pierce: What is happening now will be a protection to you in days ahead. The Beast is a coalition that is organized to manipulate the transference of wealth this hour. There will be one more great shaking in the next month. Then we must see how to move with revelation that will secure the operations of God's Kingdom for the next two years. The Lord would say, "Don't fear being sucked up by the sinking financial hole that has formed. By February 19-21, you will find that monies and supply that you thought were gone for good, have been waiting to find their way back to you. Even though you have shut accounts from the past, the monies are being held for you to steward again." Chuck Pierce: "There is a change in your field that's coming. Do not try to overprotect those in the change; just announce the change is coming, and be aware that we all will be affected and must make a move. In the midst of that, know that I will send an overshadowing opportunity back in your way in days ahead. When this overshadowing comes, ask for clear revelation on how to increase. The next six months, beginning now, will be key for you to understand the changes in the field so you can see a shift in My provision in days ahead. Do not be fearful. Be at peace, make your changes, and watch Me send in what you need for the future in your field." P.S. – Oh, and a Quick Note to our readers: To have daily, encouraging prophetic emails from The Elijah List sent to your inbox, just CLICK HERE or go to:http://elijahlist.com/subscribe. PLUS: HEY! 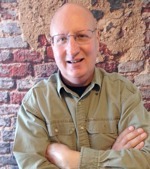 Please EXPLORE our more than 4,000 Christian Prophetic books, CDs, and gifts at: elijahshopper.com. Although many things in the world around us may seem to be spiraling out of control, the LORD is continuing to speak to His people. He is our strong tower in time of need, and the One who aligns our emotions so we can hear and embrace His revelation for this season. This was clearly seen in our services yesterday. 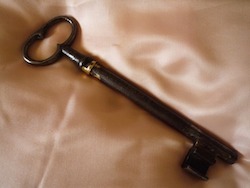 Don't miss the key dreams and prophetic revelation below! We are watching history being made. Most of America, and perhaps the world, thought that the Federal Reserve was the most powerful economic agency in the world. However, the incident of the market drop yesterday refuted that idea. China showed that they could manipulate the world market for their benefit as we approach the new Jewish Year, 5776, and the new civil year 2016. The Lord revealed this to me in 1986. The two dreams below given by the Lord to Anne Tate and Emma Moore reveal the future of the economic world. Pray for me as I continue writing the third book that will project key revelation for God's Kingdom people through 2026. Emotion vs. Vision: Shutting Unwanted, Soulish Doors! The LORD had me begin Sunday morning during our Triumphant Faith Institute component with a message on "Emotion vs. Vision: Shutting Unwanted, Soulish Doors!" In a time when much seems to be shaking, we must not allow our emotions to dictate how we respond to hurts, fears or confusion. Rather, we must allow Holy Spirit to bring healing and deliverance to areas that will close off access that the enemy has been using, to distract and capture us. This is a message that some of you will want to hear several times, and one that will give you hope to rise to a new level of discernment and wholeness. Finding Your Place in the Company of the LORD! 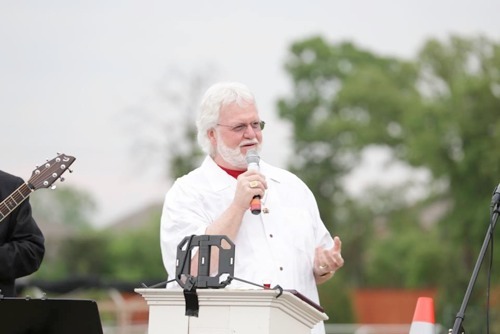 During our Celebration Service on Sunday, Robert Heidler shared on "Finding Your Place in the Company of the LORD: The Host of Heaven and His Army on Earth!" As we push to complete this year of Ayin Hei with a new strength, we must understand with whom we are aligned. In this first of two messages by Robert, he taught on angels and how we partner with the army of Heaven. I am fond of saying, "Don't run off the angels!" We are entering a season when we will need the angels to interact with us as never before, so don't miss Robert's teaching that will open your eyes in a new way to the host of Heaven. Next week he will continue this message by teaching on God's Army on the Earth! During the service on Sunday, I invited Anne Tate to share a dream that speaks into the global financial gyrations we are seeing. After she shared the dream publicly, Emma Moore (one of our financial records stewards), shared another key dream. I wanted to share both of these dreams with you, along with what I hear the Lord communicating through these dreams. Dream 1: Winter Will Come! You Will See That Finances You Are Owed Will Return! The weather was icy and snowy. There was a big sinkhole in the street that was surrounded by ice. I was trying not to get sucked up by the hole that had a slippery edge. A person from my past showed up with papers in hand. He was explaining why he hadn't sent me the money he owed me. He said my account had been closed. Then I woke up. I was standing in a large field under a single tree – which is interesting because we're in the month when the King is in the field. I was trying to protect someone and when I came to them, I said, "The Beast has been loosed!" The person I was trying to protect got up and they were able to run. I turned and saw a BULL and it was running straight for me and I knew I couldn't do anything. Suddenly the bull was over me and I was under it and I was at peace; the BULL was just standing there. I said, "Lord, Chuck gave a word when we were in Malaysia that said when you get in a situation that you can't do anything about, ask for an angel. So You're going to have to send an angel to help me here." I knew it was fall because the grass was not green, but dying, and the tree's leaves had turned colors. It seemed to me that we will be "under" the bull for a while because when the dream ended I was still under him and it was part of what the Lord did to assist me angelically. We must understand that a tremendous economic shift is going on. However, I want you to stop and understand one thing about wealth: Wealth does not go away. Rather, wealth is transferred from place to place to place. You are not to think, "Oh my, everything is going to crash and the wealth will be gone." That is not how it works. Rather, you are to ask "How will it be transferred?" and "How will this transfer affect you?" China has now taken the lead in economic influence, transfer, and manipulation. Eventually the BULL will overshadow you. That means to hover over you. That says that the market is being restructured. Gain revelation from the changes that occur this week. Ask for angelic assistance on how to move. What is happening now will be a protection to you in days ahead. The Beast is a coalition that is organized to manipulate the transference of wealth this hour. There will be one more great shaking in the next month. Then we must see how to move with revelation that will secure the operations of God's Kingdom for the next two years. We've heard prophecies this year about the economic shift that would be taking place by September 2016. What I prophesied was that we wouldn't start seeing the new order of that shift until mid-February into March 2016. Therefore, I think we're seeing the shift happen right now, and people have to know what to do. Understand that this shift is going to affect you in whatever field you are in. You can be fearful in the midst of this shift, or you can stand in that field and attempt to help others make it through without their emotional crash. Anne's dream is about a Bull market returning, but this market will be controlled by a coalition, rather than the Federal Reserve System manipulations. In your field there will come a time when the bull will be predominant. People need to make financial decisions now, but that can be very difficult because of emotional attachments to money. Some people need to get out of stocks and bonds, and make decisions to do that. You have to make your decisions, but if you live in fear then you will never grab hold of the "bull-beast" when he begins to overshadow in the spring. In the midst of what we're going through, there is a secure, peaceful place to be confined. Don't fear Babylon. God will bring angelic help to reveal how the overshadowing of the "bull-beast" coalition will cause us to prosper in days ahead. "There is a change in your field that's coming. 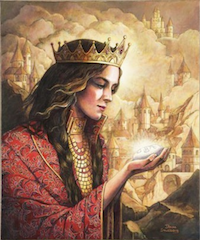 Do not try to overprotect those in the change; just announce the change is coming, and be aware that we all will be affected and must make a move. In the midst of that, know that I will send an overshadowing opportunity back in your way in days ahead. "When this overshadowing comes, ask for clear revelation on how to increase. The next six months, beginning now, will be key for you to understand the changes in the field so you can see a shift in My provision in days ahead. Do not be fearful. Be at peace, make your changes, and watch Me send in what you need for the future in your field." 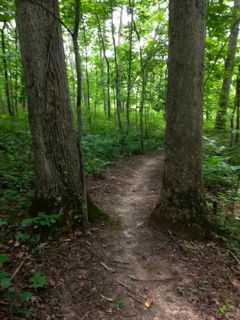 If you live in the woods as we do, you probably also have lots of dead trees to cut down--or that you have already cut down. 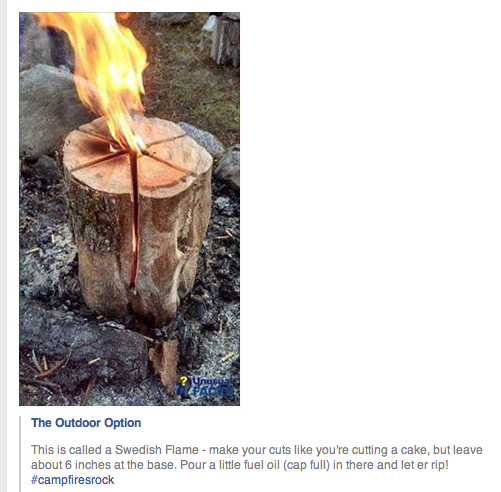 This looks like an interesting way to use some of that wood. Below is an excerpt from a beautiful tribute by Melissa Joy Kong to the lives of Ty & Terri Schenzel, pastors/founders of the Hope Center in Omaha, NE. They were killed one week ago today in a head on collision as they were heading to a conference with another couple. They have affected the lives of thousands, including our youngest son, who was in Ty's Youth Group when we lived in Omaha. You can read the rest of the article here. "Today, we said “goodbye,” and “thank you,” and “we love you” to Ty and Terri Schenzel. Thousands of people showed up. Thousands. That’s how deep and vast their love spread. Ty was known for joking, “Jesus loves everyone…but I think he loves me more!”Which is perfect, because that’s how the two of them made everyone they met feel. Every interaction was important. Every moment they spent with people was so breathtakingly intentional. There are thousands of us who have been infected with their overwhelming love. Each of us who have gotten to know them has experienced a piece of heaven on earth. They live on in their four gracious, loving, beautiful children, who inspired thousands today with their touching eulogy — with the immense love they have for their parents, and for each other. They live on in each of us who got to know Ty and Terri — however long or short, whenever the season. I miss them deeply. I’m always going to miss them. If you’re reading this, it might feel like a story about their death. But it isn’t. It’s a story about their life. So many of us wait our whole lives for happiness. We wait the whole year for summer. We wait the whole week for Friday. Not Ty and Terri. They never waited. Every year, every season, every week of their lives was bursting with love, grace, and intentionality. While incomprehensibly bittersweet, it is fitting that they left this earth together on a warm, sunny Thursday afternoon. Because they were the kind of people who never waited for Friday. If you’re reading this and you never got to meet Ty and Terri, I think they’d want you to know that they really wish they could have met you. That they believe in you. That they are proud of who you’re becoming. That they want you to live a life full of joy and hope and love. They’d want you to know that you matter. That your life was given to you so you could do something breathtaking with it. That you are a gift, and the world wants to break you open, pour light in, and encourage you to share all you have to give with as many people as possible. They would tell you to pour love into, and squeeze as much life out of, every single day. As much as you can. They would tell you that there’s a question inside each of you that you were born to help the world answer. A problem you were built to solve. A pain you were meant to heal. They’d tell you to go pursue that deep calling in your heart. Don’t wait for Friday when every day was made for you. They’d tell you if they could." I Agree! Where Is The Christian World? I agree with this article from Israel Today Magazine. Why are Christians not outraged? Why are we not seeking ways to help these--our brothers & sisters? Wouldn't we want and expect that if we were in this situation? What does this say about Christianity and Christians? What would Jesus do? Hasn't He sent us to be His representatives on earth? Are we being good witnesses to His love? The photo to the left is of a young Christian girl whose family fled Syria ahead of invading jihadist hordes and today lives as beggars on the streets of northern Turkey. She is just one of a great many in a similar situation, and they are the lucky ones. Countless other Christians have been brutalized and massacred in the Middle East in recent years. The photo was shared on Facebook by the Israeli Christian Lobby, a group of Arabic-speaking Christians that both lobbies for Christian issues in Israel and publicizes the fact that the Jewish state is the one safe place for Christians in this volatile region. While Israel is ill-equipped to handle a flood of refugees, the response from average Israelis, at least on Facebook, was overwhelmingly positive. “We must give them shelter in Israel,” wrote one Jewish commenter. “Bring them to the Land [of Israel]!! !” insisted another. “Who better than our people knows this [suffering]?” noted one Israeli Jewess. “She should seek refuge in Israel,” recommended a respondent. Others were outraged at the plight of these Christians and the lack of response by the global Christian leadership. Not only did I enjoy my walk in the woods this a.m. but I had company. 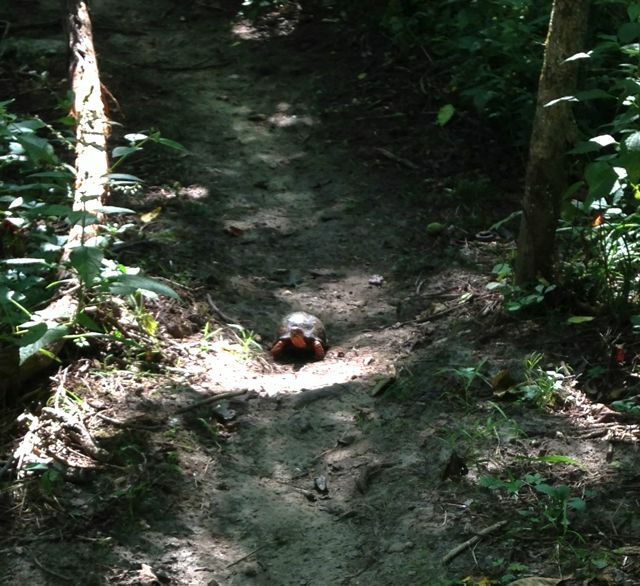 Look who was also traveling the path. She looked as if she was coming to meet me. This little guy below was just learning to fly. He was perched on a branch next to the trail. When I walked by he flew a short distance along the path so, of course, I caught up with him. 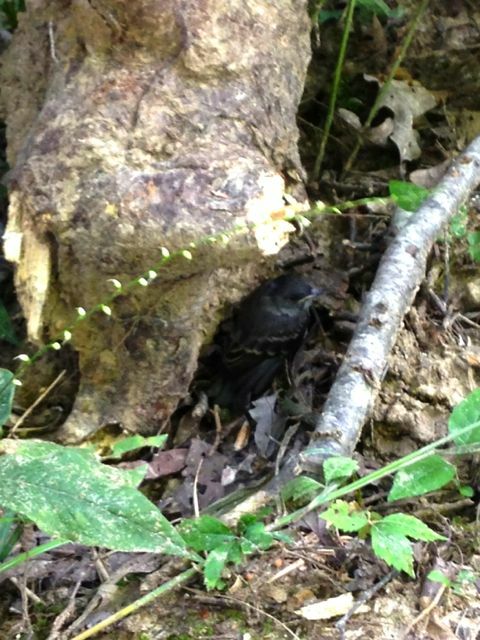 He flew ahead again and thought he was invisible in the shelter of the tree trunk. It was a fun and invigorating walk! This is an excellent word by Bill Yount on honor--something we have forgotten how to do, it seems. I saw what appeared to be high-ranking angels descending upon the earth decreeing: "Honor! Honor! Honor! Release the power of honor upon the earth!" "Honor all men. Love the brotherhood. Fear God. 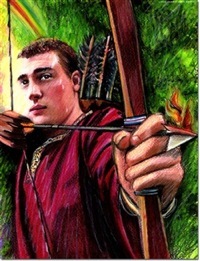 Honor the king!" (1 Peter 2:17). The word honor means to set a price on, value, esteem, regardor respect. From Heaven's perspective, whole nations, cities, and people are dying from the lack of honor. But through one simple word of respect, I saw the hand of God coming upon the earth to move upon whomever we honored. Great honor was coming upon you now! Gold medals were being given to those who took the blame, making peace with others even when you knew you were right. Crowns were now being placed upon heads while wearing your gold medal too. There were also medals being given for "unanswered" prayers. You cried out earnestly for God to answer your prayer, but there was seemingly no answer (or at least not the answer you had been looking for), but yet having not seen, you still believed. Through great brokenness and humility, honor was now coming upon many. Proverbs 15:33 says, "...humility comes before honor." With this honor was coming great authority. And with this great authority came responsibility for us to honor others. I also saw an "honor" scroll being opened as a great cloud of witnesses in glory stood to their feet! This honor scroll was opened and unfurled across the earth. High-ranking military angels began stepping down out of Heaven, and appeared to be disengaging in Heavenly warfare to release overdue honor upon the earth that would ultimately change many hearts and minds of mankind, bringing Heaven down to earth. 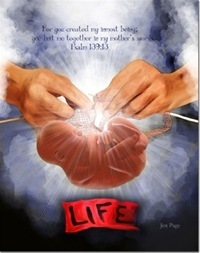 Great honor in Heaven was being given to unborn babies whose destinies would have turned the world upside down by now. Love and hugs from earth would have squeezed out many cures of infirmities and diseases on the earth had they been loved and honored when they were sent. God was alerting us with one more opportunity to respect the womb and the treasure inside of it, which He wants to bring forth to bless us. Honoring thy father and mother all the days of thy life was releasing long awaited healings and miracles! Exodus 20:12says, "Honor thy father and thy mother: that thy days may be long upon the land which the Lord thy God giveth thee." A doctor attending our church felt led to take time off work and visit his father and mother who lived in Florida. He took a month off to bless them and love on them. Upon returning home, this doctor had a physical check-up and was diagnosed with colon cancer. He said that when his physician said the word "cancer" to him, he had a strange peace come over him and the Lord spoke, "Since you have honored your father and mother, I am going to heal you and give you a long life!" That doctor has no cancer now! I sense that even as our fathers and mothers age, the first commandment promising long life becomes vital in fulfilling our long range purposes on the earth. I once heard a story about a little boy who came to school one day carrying his little plastic guitar. Because that was so unusual, the teacher asked him what he was doing with it. He told his teacher, "I am going to be a great country singer when I grow up." The teacher took the little boy by the hand and walked him down to the principal's office. She said to the principal, "I want to introduce you to a great country singer legend. Would you allow him to sing over the PA system this morning?" The little boy sang his heart out. Years later, that little boy became a country singer. While doing a documentary of his success, he mentioned his teacher in elementary school who believed in him and respected his dream. As a result of not honoring others, we have not been honored. 1 Timothy 2:1-4, "I exhort therefore, first of all, that supplications, prayers, intercessions, thanksgivings, be made for all men; for kings and all that are in high place; that we may lead a tranquil and quiet life in all godliness and gravity. This is good and acceptable in the sight of God our Saviour; Who would have all men to be saved, and come to the knowledge of the truth." Romans 13:1 ...for there is no power but of God; and the powers that be are ordained of God. Many will be called at this time to stand before nations, kings, cities, tribes, orphans, widows, babies, and even the unborn to honor them. When we honor someone, something powerful happens in us, because in honoring others we are honoring God as well, since "all men" were created in His image. Don't wait to find a good reason to honor someone. You may be waiting forever. Let's honor them because God said so. 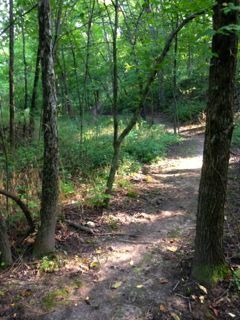 Our son, Greg, and his friend, Caleb, have made a wonderful mountain biking path in our woods. 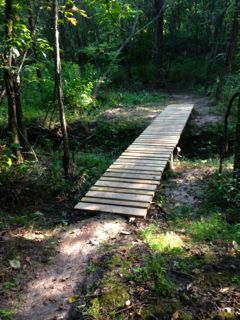 They even built a very substantial bridge to cross a small ravine. I mowed the sides of the path with my trusty DR Trimmer/Mower to make it wider. 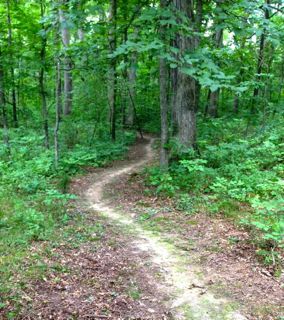 Now Country Guy & I have a perfect path for hiking. Right now it is one mile in length, but the guys tell me they are making plans for "Phase 2" once the leaves are off the trees so they can see where they want to continue the path. The dream has been a long time in coming but it appears to be here! Thank you, Jesus, for allowing and providing this great pleasure! Jeremy Riddle is one of the talented song writers/worship leaders at Bethel Church in Redding, CA. I love his heart! It seems to me you can't get any better than him pared with Stephanie (Frizzzel) Gretzinger. I found this wonderful time of worship with them and Sean Feucht at LCMI on youtube.com today. What a gift!! 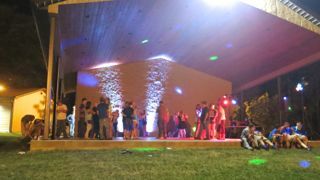 Last night's Back to School Teen Dance at our new amphitheater was great fun! This was the second dance we held for teens. The first one in July was also fun and attended by about 25 teens which we thought was pretty good since it was the first time we had tried doing something for the younger generation. It seems it is difficult to get things started around here. I am one of those who wants to go to the first event to see if I like it, but it seems many people want to see if the event is successful before they decide to commit. Anyway there were over 50 kids at this dance and they all seemed to be glad to have a place to hang out with their friends. Shadow Wallace did the sound & lights. The atmosphere he created added much to the enjoyment. I enjoy Doug Addison's prophetic words and am encouraged by them. This one is especially encouraging to me at this junction in my life. "Prophetic Word: Five Months of Grace"
We are coming to a tipping point that will be here from August through September. Over the next few months, things will be established in your life even though it may not be crystal clear just yet. God is revealing His hidden plans for you. Expect to see rapid changes begin to take place. You will need to battle through discouragement, attacks against relationships, and your health. The enemy is continuing to overplay his attacks against many people. This is because there is a powerful breakthrough coming for those who stand through the storms. There will be a greater level of repayment coming for those who make it through the season. Prophetic dreams will continue to increase. An unusual amount of wisdom and favor is being released right now. If you or someone you know has been under attack by the enemy then there is a good chance that you are a strategic person in the Kingdom of God. The enemy is trying to take out those who will be a part of this new move of God that's coming. Those on the front lines have been suffering from burnout, repeated attacks from the enemy, sickness, and discouragement. The enemy is trying to take out those who have been battling and doing the work for the Kingdom. The only way to get through this attack is to pull back and get a new strategy. Those who stay on the front lines right now in the midst of this battle are in danger of being taken out. It does not mean you have to step out of what you are doing. Instead, step back and regroup. Increase your intercession, get a new plan, and in many cases, people need to establish new associations. The source of the enemy's attacks is going to be revealed over the next five months. God is going to reveal the strategic attacks from the enemy that have been holding people down and keeping them from advancing. If you have been seeing a repeated cycle of defeat or discouragement in your life, then this prophetic word is for you. You will need to exercise God's wisdom. There is power and favor in resting and regrouping. The next five months will be a strategic time to gain deeper understanding about your situation. In October there will be a release of new assignments, and angelic help will come to move you swiftly into your calling. Destinies will be revealed. This is a time to plan long. I had a prophetic dream that a silver, glowing flashlight appeared in midair right before me. In the dream I knew it was an angel being assigned to shine the way through this dark season that many people are going through. I was jumping up and down rejoicing because of the angelic assignments that were happening. Expect to see deeper insight into your situation as God assigns angels to shine His light and guide you during this season. The meaning of this dream is that God is bringing back gifts, anointings, and callings that we have had previously. It is an invitation to go deeper into the Spirit right now. Water represents the Spirit, and swim shorts represent our ability to go deep. That two-for-one means God is doubling what He has previously given to you. I had a dream that I was standing on a deck that overlooked the most beautiful crystal clear blue ocean. Suddenly, I could see a very large black shark coming towards the deck. It jumped up out of the water and lunged at me. I ran back in the house where I was staying, and the shark slid across the floor towards me. But then it turned into a seal. This dream indicates that the enemy is trying to attack us with fear, but God is going to turn that around and reveal something positive from it. Seals can represent fun and a good time, as well as God's seal upon you. One of the keys for now is to break through fear and not let the enemy intimidate you. God will be speaking through dreams over the next few months. It will require wisdom not only to understand the dreams, but to know how to respond. As you get into God's timing, an uncommon amount of God's favor will begin to flow in your life. Get ready for dreams and supernatural encounters. Expect wisdom, revelation, and strategies. Watch how the plans of the enemy are revealed, while God releases strategic alignment into His timing for your life. Prepare yourself for unprecedented amounts of grace and favor! Things are going to heat up in a good way in the spiritual realm. Grace, hope, and love to you. What A Fun Redneck Pool Party!